Special Containment Procedures: SCP-2974 is to be kept in a 76-liter glass terrarium with paper towel substrate, at least 2 commercially-available hides, 3 to 5 false logs or branches, and 4-7 pieces of slate rock to facilitate basking. For enrichment purposes, the placement and number of items is to be changed monthly. The terrarium will be kept with a temperature gradient to facilitate temperature regulation. This temperature gradient must be 29.5 degrees Celsius on the warm side, and 23.3 degrees Celsius on the cool side, and will be maintained with an under-tank heater with an attached thermostat. Due to the condition of SCP-2974, water bowls, humid hides, and mistings are not permitted. The terrarium must stay at no more than 30% humidity at all times to prevent decay. SCP-2974 does not require food, but pre-killed insects may be provided for enrichment purposes. Surveillance equipment is to remain out of visual range of SCP-2974. Description: SCP-2974 is the corpse of a male eastern fence lizard (Sceloporus undulatus). It is 18.3 cm long, and appears to have died in the summer due to the breeding coloration on its sides and throat. It is currently animate due to an unidentified anomaly, despite having been unintentionally preserved ██ years ago by the ███████ Company1. SCP-2974 does not appear to be hampered by its desiccation, and is capable of movement and activities with the same proficiency as non-anomalous fence lizards, including avoiding obstacles and hunting prey insects. It will ignore female lizards of the same species, and smaller or equal-sized lizards of different species, and attempt to hide from its native predators if one is placed near the terrarium. It displays typical territorial behavior when confronted with a male lizard of the same species. However, it will attempt to attack them even when control lizards do not register the presence of an intruder. 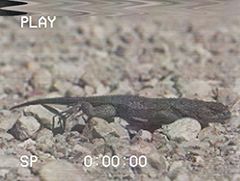 The current theory is that SCP-2974 has anomalously heightened perception which allows it to sense other male eastern fence lizards through olfactory and visual barriers. It is currently unclear how SCP-2974 is able to behave as it does despite damage to its muscles and organs from being processed as trail mix. SCP-2974 reacts to video recording equipment as a control lizard would react to a predator, and will attempt to hide from visible cameras. As long as the cameras are not within visual range of it, it will not react to their presence. Other surveillance equipment, such as audio or infrared recording devices, do not cause SCP-2974 to react negatively. SCP-2974 was recovered in its current state after reports of a "mummy lizard" from the University of ████████, ███████ ████ were investigated. Questioning of the involved students revealed that the anomaly was discovered in an on-campus vending machine in a bag of trail mix. Class-A amnestics were administered to the students involved, and VCR tapes2 labeled "Night of the Mummy Lizard" were seized and placed into storage. Analysis of the packaging revealed that it matched that of the ███████ Company, located in Memphis, Tennessee. How SCP-2974 remained undiscovered during transit and stocking is uncertain; interviews with the drivers and workers involved revealed that none of them had noticed the presence of the lizard. Addendum A: On October ██, ████, a fault in the heat lamp installed at the time caused the substrate within the terrarium to combust. While the fire was dealt with in a timely fashion, unfortunately SCP-2974 lost the lower portion of its right forelimb to fire damage. As a result, containment procedures for this object and other reptilian SCP objects were revised in light of the incident. Containment procedures for SCP-2974 will be adjusted in light of new discoveries regarding eastern fence lizard care from now on. SCP-2974 was relocated to Area-12 and placed under the purview of Doctor Jept. Addendum B: In light of SCP-2974's repeated attempts to function as a non-anomalous lizard despite missing its forelimb, a replacement forelimb has been constructed from plastic and a foam liner in order to prevent further damage to the object. The prosthetic is firmly attached to the object, and has been designed to not require additional maintenance beyond attachment. 1. A producer and supplier of trail mix snacks for vending machines. It has been defunct for ██ years as of the last update to this document. 2. Video footage recovered is available to level 2 and above researchers on request.